After a couple of weeks of heavy rain, the weather here in Southern California has been spectacularly beautiful for the past few days: clear skies, mid-70s, and just a hint of a breeze. Inkblot and Domino, of course, are pleased that their staff managed to twist a few arms and make this happen. 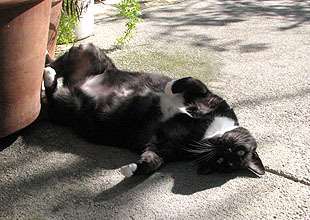 On the left, Domino celebrates by rolling around in the sunshine and waiting for her masseur to come over and rub her belly. 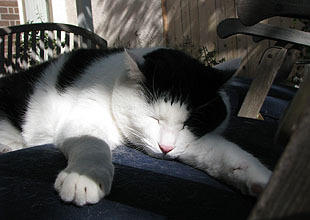 On the right, Inkblot employs the long-awaited sunshine to its highest and best purpose. Have a nice weekend, everyone.